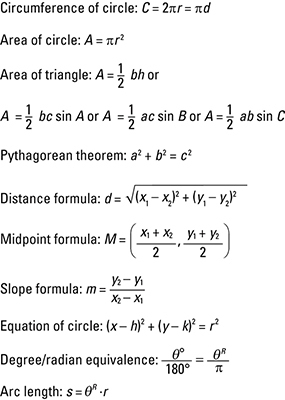 Many of the formulas used in trigonometry are also found in algebra and analytic geometry. But trigonometry also has some special formulas usually found just in those discussions. A formula provides you a rule or equation that you can count on to work, every single time. A formula gives a relationship between particular quantities and units. The main trick to using formulas is to know what the different letters represent. In the formulas given here, you have: r (radius); d (diameter or distance); b (base or measure of a side); h (height); a, b, c (measures of sides); x, y (coordinates on a graph); m (slope); M (midpoint); h, k (horizontal and vertical distances from the center); θ (angle theta); and s (arc length). The formulas particular to trigonometry have: sin (sine), cos (cosine), and tan (tangent), although only sin is represented here.